The large living room ideas featured in this gallery showcase contemporary, modern, traditional, rustic, eclectic, and craftsman interior designs. These custom formal & casual rooms were created by top designers and feature gorgeous furniture, outdoor views, and lavish decor. We hope these pictures give you plenty of design ideas and inspiration for creating your own luxury living rooms. The colorful palette of the mountains seen through the attached balcony of this contemporary living room is reflected by the varied design elements seen in the room. From the tans of the travertine floor tiles, wool loop rug, and painted walls to the dark browns of the wooden center coffee table and coffered ceiling – all ranges of earth tones and cool blues can be seen in this space. 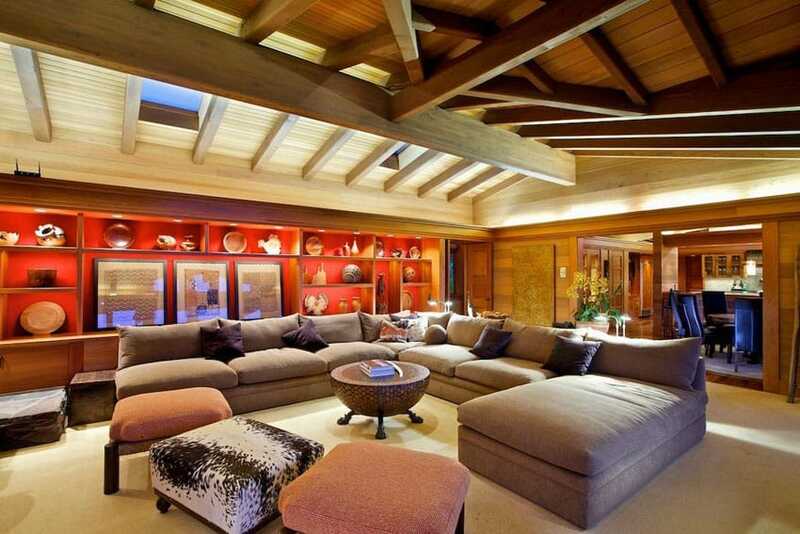 The choice of mid-century modern long couches with varying colored throw pillows is a nice, personal, and modern touch. This Chihuly-inspired light fixture – more a work of art than anything else at this point – is the main attraction in this stylish living room design. The denim-like gray fabric of the sectional couch seems to match perfectly with the gray painted accent walls that surround the picturesque twilight city views. The warmth of the Cherry floorboards are supplemented by the shag area rug. The other furniture and décor have a modern feel that fit the room exquisitely. Two toned wall colors help add dimension and break up the large space. 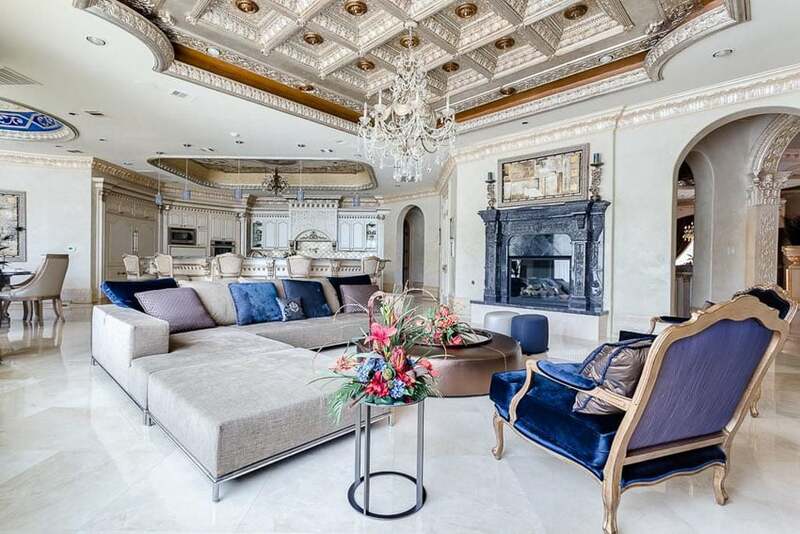 The high box ceiling of this high-end living room sports decorative molding with details so intricate, one could almost feel the spirit of its workmanship. The white marble floors match the traditional elegance of the glass chandelier, blue porcelain fireplace, and Victorian aesthetics of the furniture. The contemporary mid-century modern style of the sectional sofa makes it somewhat of an odd-man out in this case but only serves to amplify the luxury of the space with its sleek, stylish design. Such a sectional sofa is a great way to separate different rooms and define the room’s design. This traditional living room uses the rustic charm of raw, minimally-treated wood on its exposed ceiling trusts and cathedral ceiling finishes. The choice of pristine white walls, coffee-tan limestone tile flooring, and light beige arm chairs and sectional sofa really keep the place feeling light and spacious. The home bar next to the living room is a welcome addition to the relatively open layout. 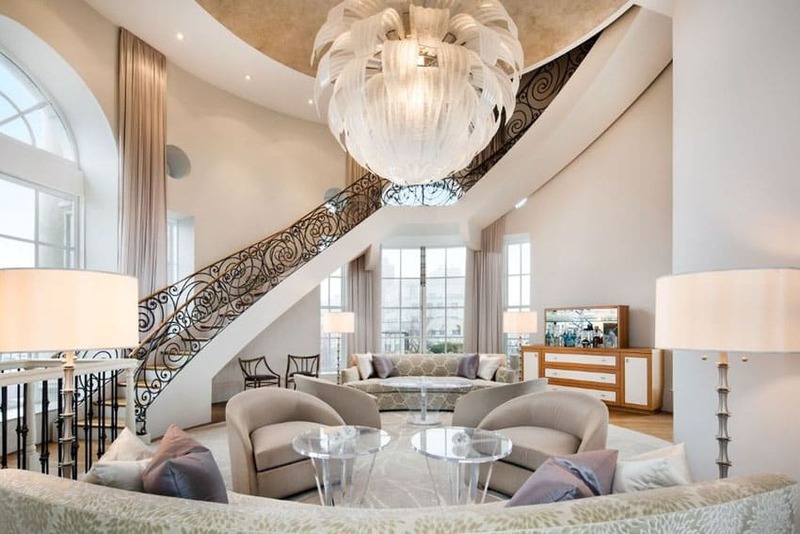 Circular staircases are used in traditional living room design to keep a place interesting, stylish, and welcoming. 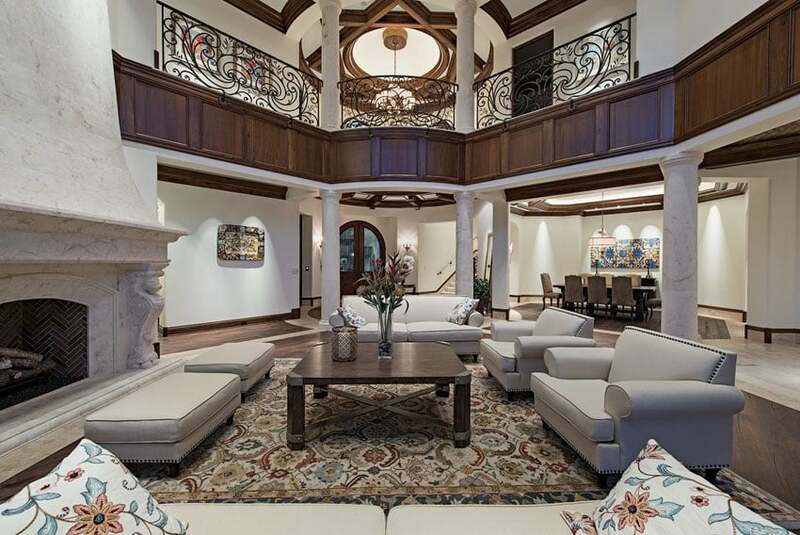 This design element is used exceptionally well here, and the charm is further enhanced by the playfully varied slopes of the ceiling, the rich brown oak wood floors, Persian area rug, and fleece English-style couch, lounge chair, and ottoman. 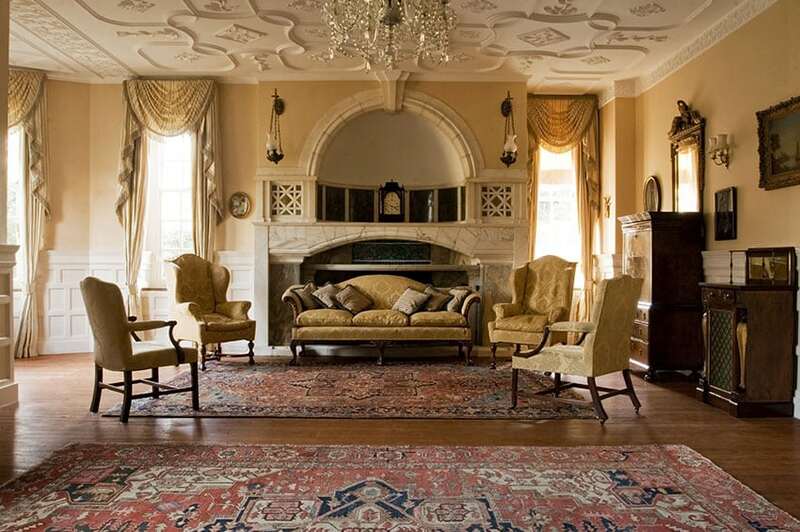 This luxury traditional example of a large living room is adorned by stylish arched windows and view doors, a classically beautiful decorative wood-burning fireplace, and wrought-iron chandelier. The stone tile flooring and stone accent columns also help give it a traditional elegance. The choice of camel back chairs and main sofa, not to mention the elegant black grand piano on the side, are all nice touches to this masterpiece. Alpine living rooms are well-known for keeping their aesthetics cozy yet elegant. A large stone fireplace with varied stone tile facings adorns the right side of the room while large brown French windows are seen to the left. 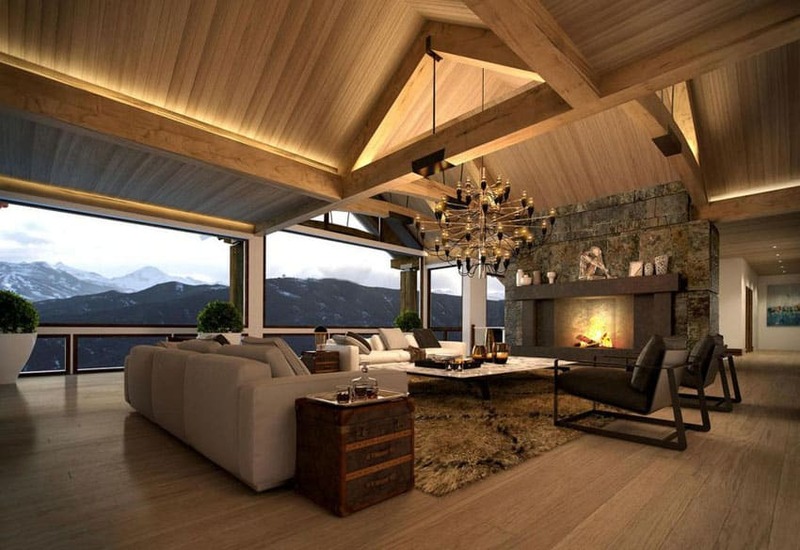 The wood flooring, wooden high ceiling, and elegant chandelier all give the room some much needed warmth. The contemporary take on the English sofa as well as the charm of the wooden coffee tables make this living room even more welcoming. Pristinely beautiful, the treatment of the walls, tray ceiling, and polished porcelain floor tiles prove how powerful and calming white can be. The circular light fixture keeps the space feeling centered and Zen. The amazing views of the ocean can be enjoyed on the mid-century modern section sofa and modern arm chairs courtesy of the large view doors and windows to the far end of the room. The herringbone patterns of the clay bricks used for the large stone fireplace is a unique design decision and one that paid off well in the end with the charm it gives to the living room. The rustic chandeliers and lighting fixtures hang from a beautiful brown wooden box ceiling. Arches, marble sculptures and beautiful artwork really give this room a traditional elegance but still manage to keep it feeling rustic and comfortable. 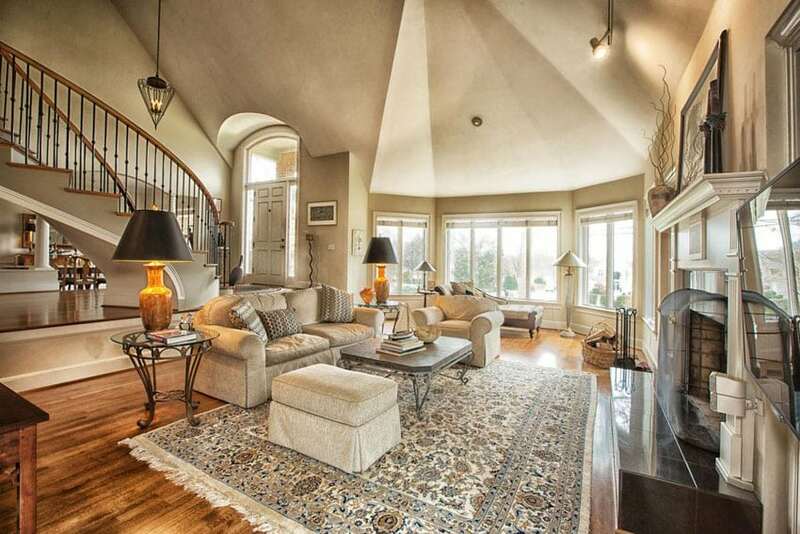 The large arched windows and French doors really help make the room feel even more spacious. The love seat sofas and upholstered lounge chairs are also nice touches. Sometimes, muted and saturated are wonderful design directions that really embody the phrase “Less is more.” In this example, black, white, and tans are the only colors to be seen in the room. The wrap-around curtain window gives users amazing views of the surround cityscapes as well as keeping the room feeling roomy and bright. The contemporary mid-century modern sofa, black tufted leather seating bench, and white contemporary lounge chairs, go amazingly well together and also with the other furniture in the room. Muted wood vinyl flooring and a classic patterned area rug give much warmth to the space, as well. 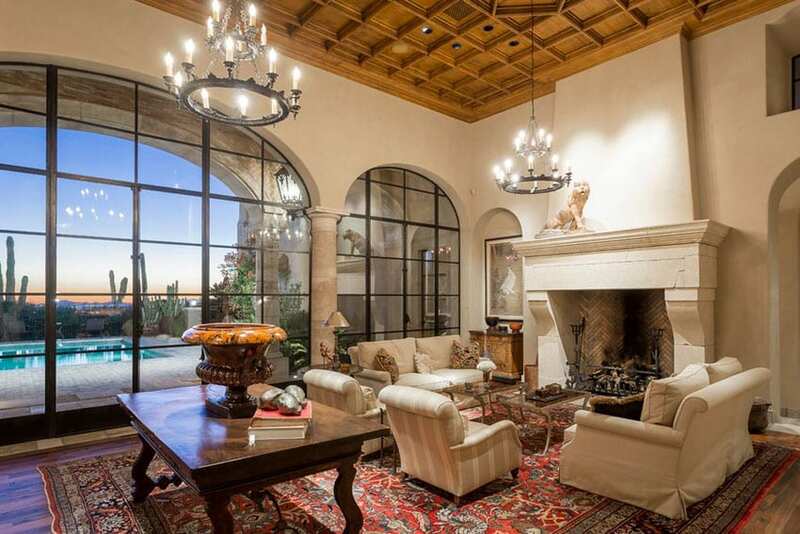 The Mediterranean style of design works amazingly well with large living rooms such as this one. 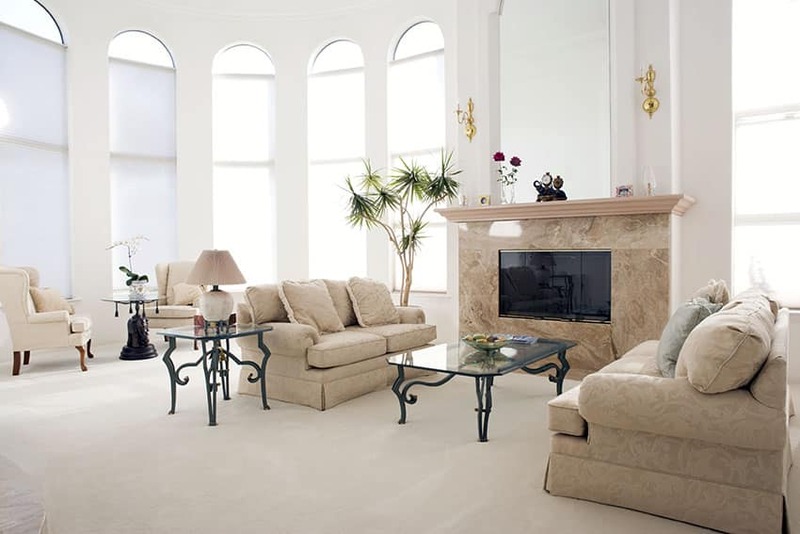 The marble fireplace works for rooms with high ceilings such as this one. The wrought iron railings for the second-story balcony is an elegant touch and drives the luxury aspect of this space home. 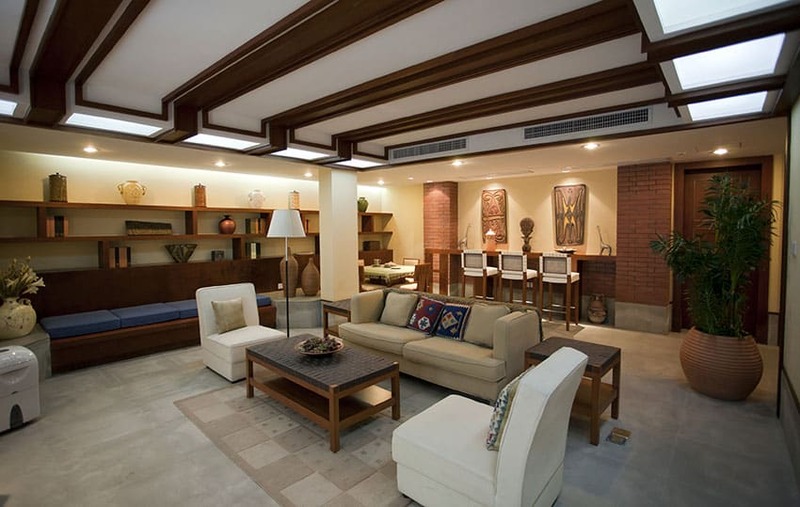 Minimalist tan leather seating furniture and solid wood furniture and wall details are extra touches that keep this space feeling sophisticated and homey. 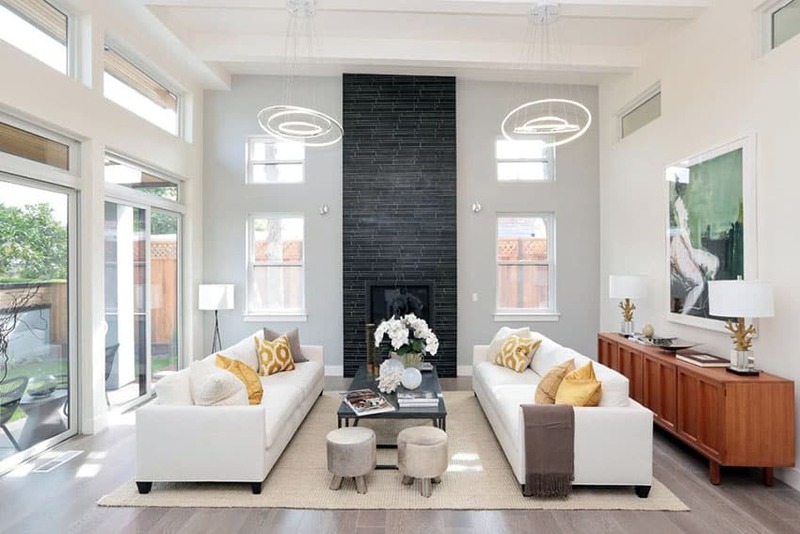 Minimalist and modern – the formal living room design example shown uses contemporary cylindrical pendant lights, paneled wooden accent walls, stone wall tiles of varying textures, and marble flooring that uses a tan that complements the neutrals of the room. The mid-century modern styling of the used sofas, coffee tables, and ottomans match the aesthetic of the space. Clean and modern, this living room design uses whites almost exclusively to keep the room feeling open and pristine. The other colors we see in the space – the brown of the teak flooring, the log base of the glass coffee table, and select dabs of black and dark colors with the room decors – only serve to further accentuate the light colors of the room. The retractable doors of the outer walls also serve to open up the room to the outdoor patio. This keeps the space flexible and gives it a wider variety of uses. The modern vibe created by this room is carried out by the use of contrasting darks and lights – seen on the love seat sofas, tan area rug, painted walls and ceilings, dark wood coffee tables, herringbone wood parquet flooring, and various dark frame and room trimmings. The playful treatment of the surfaces of the walls and especially the ceiling make the room and visually and aesthetically exciting. The city views seen through the view doors and windows also make the space feel open and light. 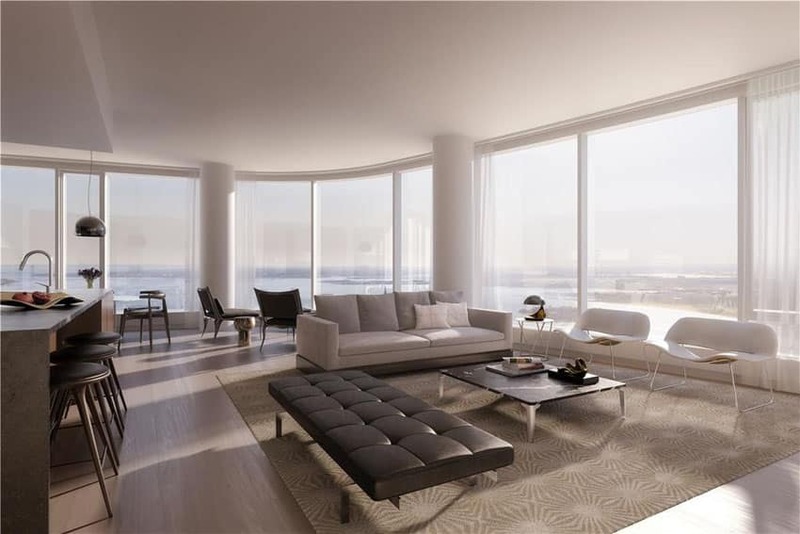 Open plans such as these give off an unparalleled sense of spaciousness and breathability. 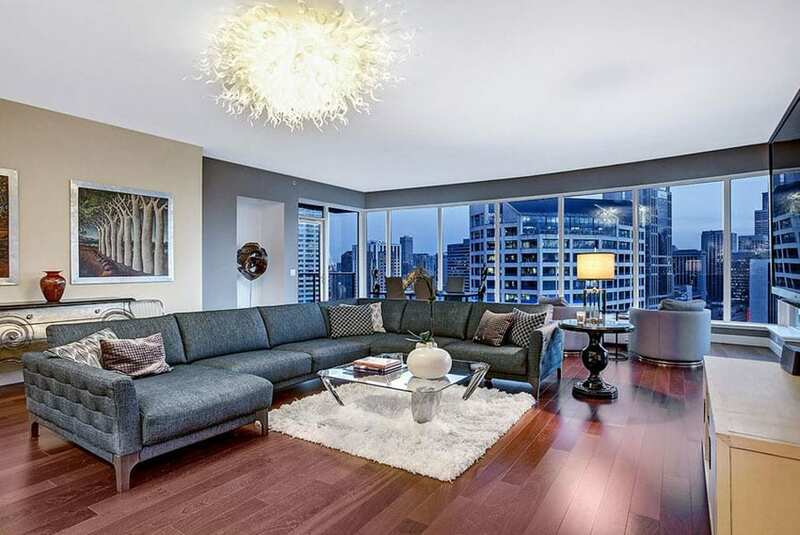 The expansive window views of this living room only serve to heighten those even more. The gray sectional couch, armchairs, and floor tiles balance off the colors of the room with their neutral tones and feel. The simple yet bold treatment of the polished stone floor, plain ceiling, and stone tile accent wall, are good foundations for the rest of the design. 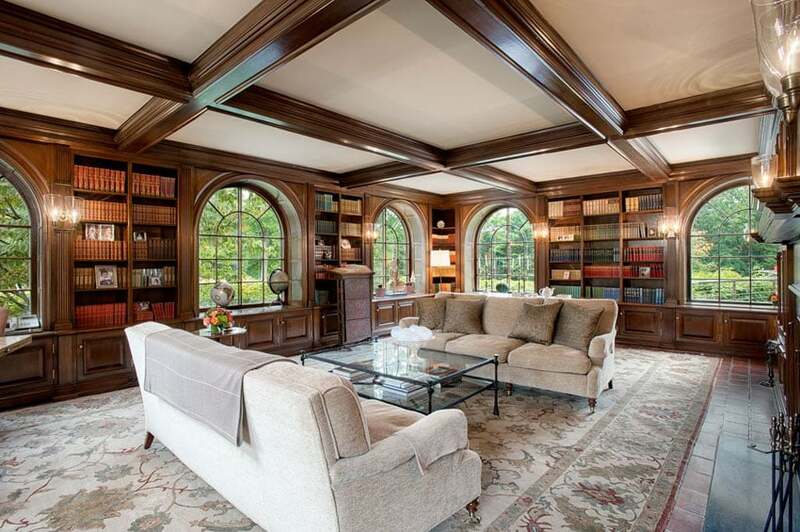 This traditional living room has built-in wood bookcases and beam ceiling that use a rich, dark cherry wood finish that really makes the room’s walls and ceilings pop. The clay tiles used for the flooring give the room an warm, rustic feel. The tan area rug and modern couches, not to mention the glass accent coffee table used, balance out the darker colors of the space. The numerous arched windows gives users views of the lush greenery of the outdoors and really brightens up the room. The brown living room takes its character from the brown leather furniture, dark weathered floor boards, and wooden panel cabinetry. The use of round columns with Neo-classical modern capitals as well as arches and tall classical view doors and windows in the foyer really make this space feel luxurious and sophisticated in its aesthetic. Mountain-top residences are wise to take advantage of their location with living room designs such as this. 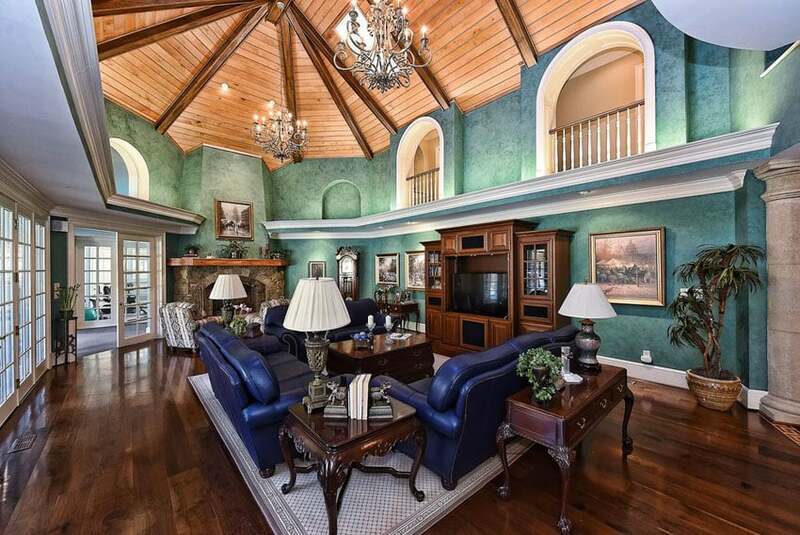 Large arched ceilings, breath-taking views of the mountains outside, and large stone fireplaces really make the space. 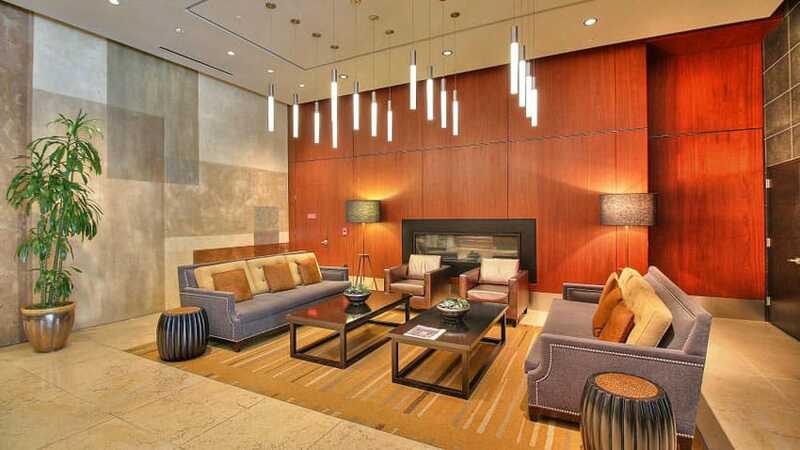 Contemporary charm can also be seen in the room with the mid-century modern couches, arm chairs, and side tables as well as the beautiful chandelier used as an accent lighting fixture. This living room takes full advantage of its forest surroundings by using large floor-to-ceiling windows that give you a wide vista of the outdoors. The varnished cherry wood flooring is a nice choice of floor finish – it really complements well the white painted walls and the modern couches and seating furniture. The splashes of muted greens on the throw pillows and area rug also complement the overall ambiance of the space. Contemporary and artful are the two words one might describe this large living room design. 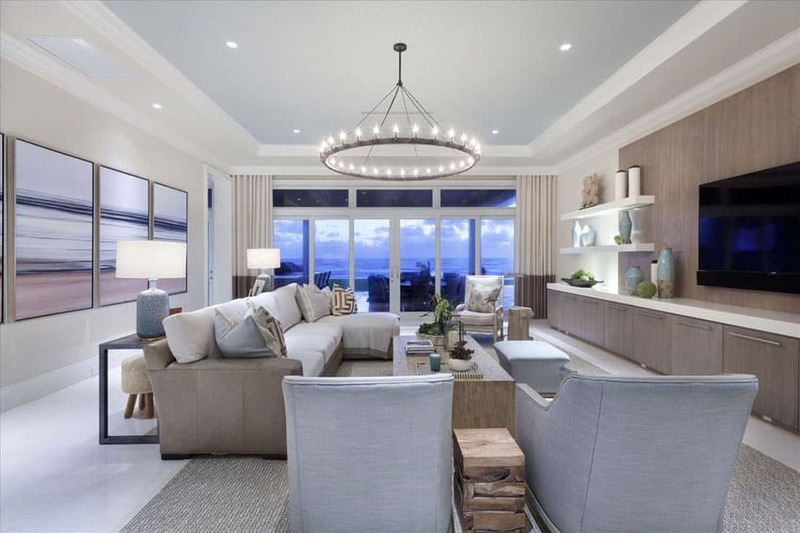 The beautiful modern light fixture is an amazing centerpiece and is joined accordingly by the tasteful gas fireplace, built in display shelves, and the treatments of the room surfaces – the marble walls and porcelain floor tiles. The choice of furniture is also equally elegant. From the minimalist seating provisions and the colorful area rug, this open patio living room design is truly a unique and stylish space. Eclectic geometric patterns adorn this example of unique interior design. From the wallpapers to the carpet, from the side tables to the window curtain – this living room really goes above and beyond in its use of interesting pattern treatments. The brown décor of this space is very subtly enhanced by the smart use of blue neon lighting for the front accent wall. The sectional couch used and the chrome legged coffee table are also nice decorative additions to the space. This living room has an open layout and a large glass door that promptly opens up the indoor space to the outdoor patio. Neutral lights are used, as seen in the light teak floorboards, beige marble accent wall, and the white painted ceiling and walls. The modern and simple look of the console, dark couch, and other furniture décor keeps the space from feeling too cluttered. The view of the outdoors also really makes this recreational space visually roomy and bright. Adding an l-shaped sectional couch is a great way to fill the space of a large living room. 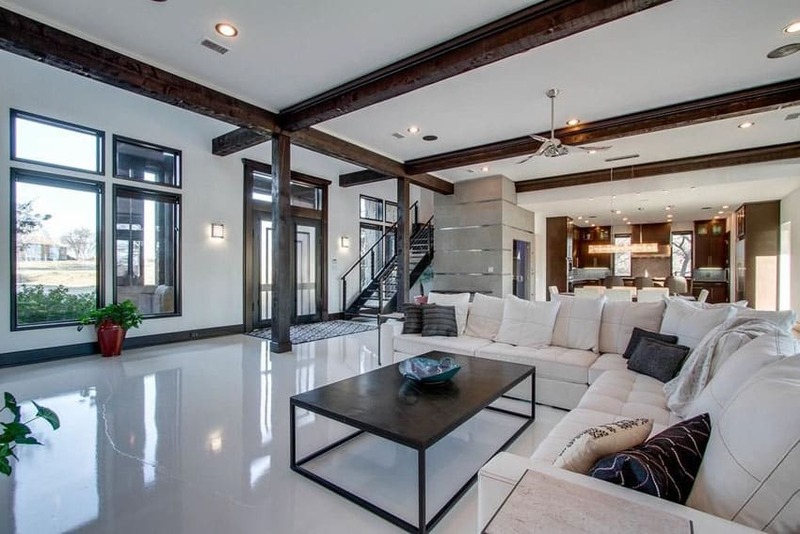 In this image the tufted white leather sectional couch, coupled with the polished white stone floor, painted walls and ceiling, are almost framed and accented by the dark browns of the coffee table, columns and beams, and door and window frames. The open layout also makes the space versatile and flexible. 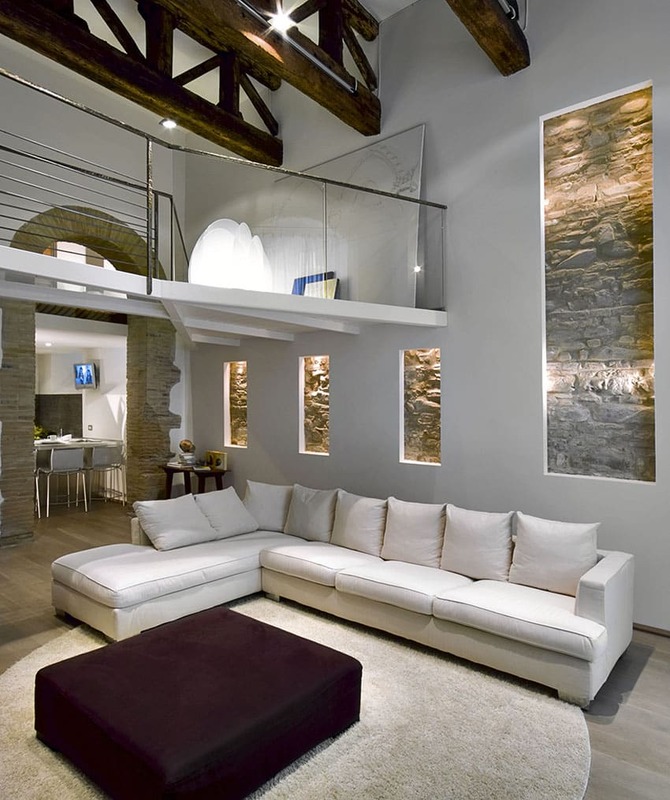 Stone and wood with a high degree of success in this rustic example of living room design. Almost “cabin in the woods” in its overall aesthetic, this space has a rustic and cozy vibe that not very many rooms can pull off this successfully. The wood plank ceiling, the stone finished fireplace accent wall, the comfortable and visually appealing seating furniture, and the various hues of the floor boards really make this space feel warm and pleasing. The beautiful views of the outdoors also helps immensely. Contemporary and minimalist designs such as this one have a risk of feeling too cold and formal. The design ingeniously addresses that concern by using rustic and welcoming design elements like the wood plank ceiling and light brown mahogany wood flooring. The smart use of glass is also seen in this example – the half landing stairs has a glass balcony while the retracting doors to patio are also made of clear glass. This eclectic design mixes in rustic charm and adventurous artistic quality to create a space that is unique and undeniably lovely. The bright red accent wall employs built-in shelving to display various shelf-top decors and pieces of art. The large sectional Lawson-style sofa mixes well wit the brightly colored and patterned ottomans. The exposed structural beams of the roof on the ceiling as well as the skylights also bring in a lot of warm charm to the room. 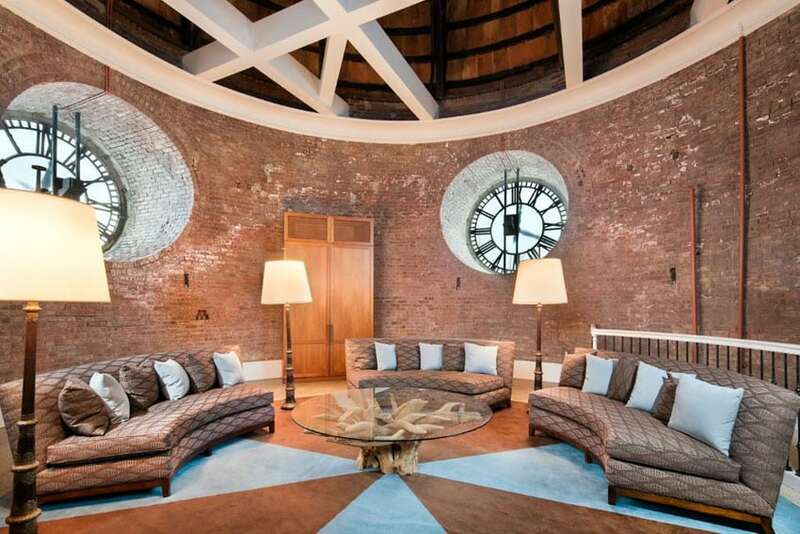 This large circular brick-walled living room has a design experience that can very seldom be repeated elsewhere. This is located within what seems to be a re-purposed clock tower, indicated by the clerestory windows that double as large clock and the round shape of the room. As if to contrast the rustic charm of the old brick wall, the design uses contemporary arching couches, a wood and glass central coffee table, and other modern style living room decors to really balance out the feel of the space. 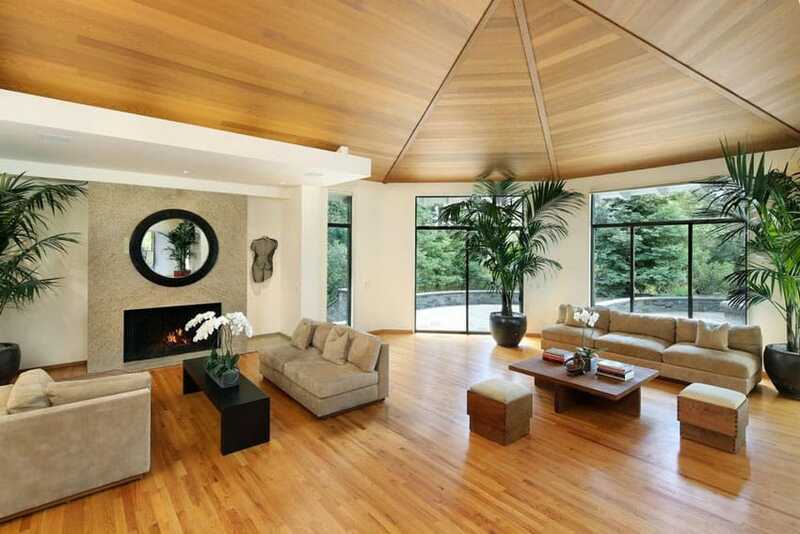 This large living room has hardwood floors and a corresponding wood-finished hip roof ceiling. This tropical-chic designer space uses decorative ferns, numerous minimalist Lawson-style couches, and warm brown and beige color palettes to complement the lush green views seen through the glass doors and windows of the outer wall. The fireplace is also a nice touch to the area, giving the room a central congregational space. The first thing to notice in this living room are the beautiful grains and wood hues of the herringbone wood floors, cleverly mirrored by the weather wood treatment of the exposed roof rafters on the high ceiling. This herringbone pattern can also be seen on the stone tiles of the room’s fireplace. The sunroom-style windows and French doors are perfect in providing light and openness to the space. The high-back white leather couches provide some much needed privacy to the space as an answer to the openness provided by the aforementioned windows and doors. 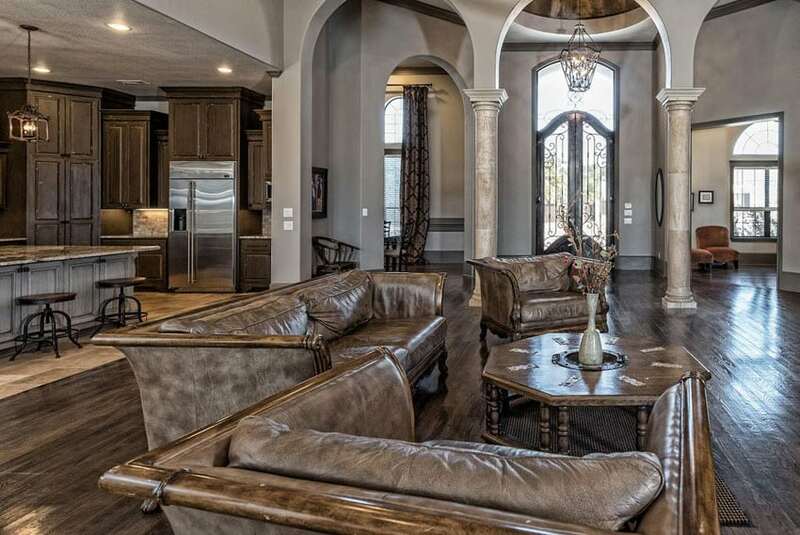 The luxury living space in this example uses high walls that terminate with a wood-plan vaulted ceiling. Hanging from that ceiling are beautiful wrought iron chandeliers that give character to the room. At the edges of the room, we have secondary lowered ceilings that really keep the proportions of the room in check. The dark brown wood floors are good partners to the green-blue treatment of the walls and the blue leather couches used in the space. The pristine and graceful ambiance of this room has its centerpiece in the beautiful, flowing flower-style chandelier that adorns its high ceiling. Aside from that, we have the circular staircase that winds around the curvilinear surface of the wall. Its wrought iron railings are perfect for the look and feel of the room. Large French doors and arching clerestory windows also line up the wall and make this white room feel even more bright and cheery. The custom built-in bookshelves of this living room are made from a dark ashen wood that can also be seen used for the polished floorboards. The arched ceiling, exposed roof girders, and the use of rustic raw wood tables and a rich black leather sectional couch make this space feel personalized and unassumingly stylish. The fireplace in the middle of the room has a texture stone finish that really goes well with all the other design elements in the space. This simple yet elegant piece of interior design really proves that sometimes less is more. White walls, white tray ceilings, and white Lawson-style sofas – this space feels uncluttered, clean and open. The glass pane view doors also contribute to the openness of the space. Splashes of color can be seen on the area rug and accent chair. The sandstone floor of this space really adds a unique character to the space and keeps the room visually exciting. The leather sectional sofa, wood-framed coffee table and armchairs, and the contemporary aesthetic of the other furniture and décor in the living room space are nice touches that go well with the overall spirit of the design. The globe light fixture illuminates the space while serving as a unique accent piece. The modern fireplace, located in a wall that serves to separate the living room space from the rest of the house, is a nice touch. 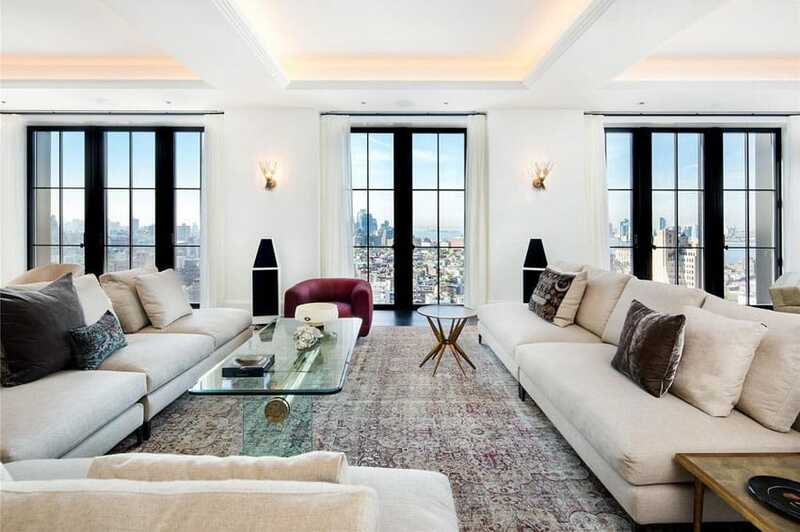 This luxury contemporary living room has high ceilings and clerestory windows that take advantage of the high verticals to let in more sunlight from the outside. 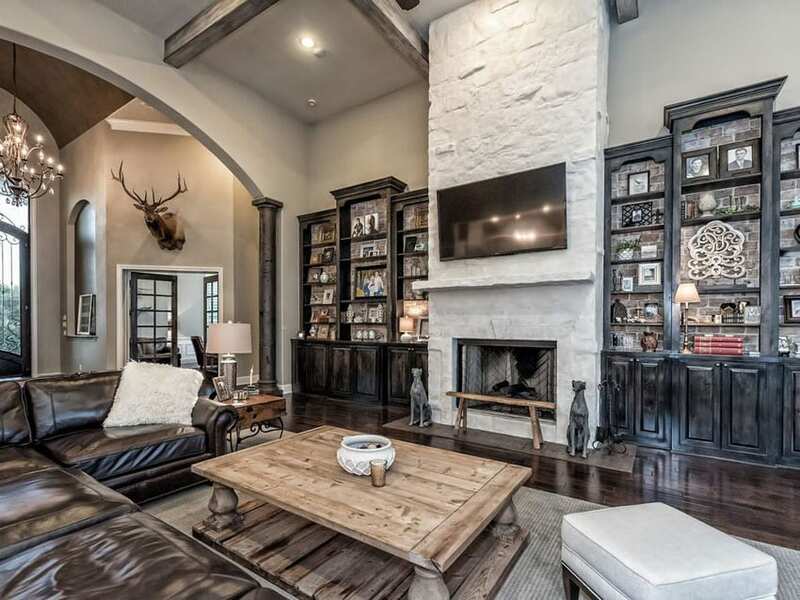 The stone accent walls go well with the polished oak wood floors. The tan leather daybed, winged barrel lounge chair, and dark fleece Lawson-style sofa are smart choices for furniture. 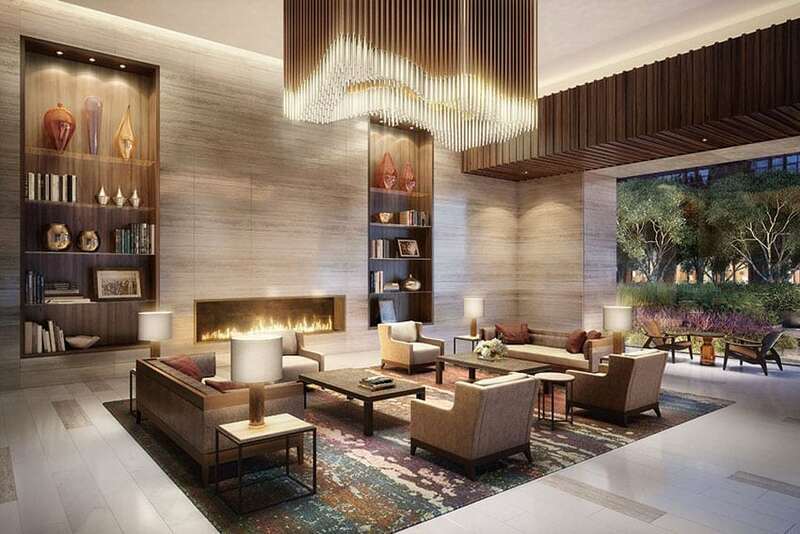 The wood-burning marble fireplace serves as a focal point for the area. Home bars are frequently located adjacent to large formal living rooms to serve as an extension of the space, so to say. The concrete tile floors give a raw and industrial feel to the space. The brick accent walls also contribute to the raw vibe. The simple yet stylish furniture used have an aesthetic that matches the contemporary feel of the other design elements – the built in decorative shelving, the beamed ceiling, and the various tabletop décor that adorn the room. Intricate details seen on the ceiling, fireplace, and even the draping curtains make this large living room elegant and luxurious. The gold furniture – the camel back sofa, arm chairs, and winged lounge chairs – go well with the golden and white colors of the walls. The stone fireplace has a custom mantle that employs a quarter spherical enclave that really serves as a good centerpiece for the living room design. The large sectional couch uses white leather upholstery that matches the look of the painted wall, circular area rug, and porcelain floor tiles of the space. The use of a dark burgandy central ottoman offsets the lights of the room. The high ceiling leaves space for a second-story mezzanine and has exposed beams that really keep the space feeling expansive yet cozy. The stone accent walls recessed in the alcoves are complementary to the exposed stone archway used at the back end of the room. 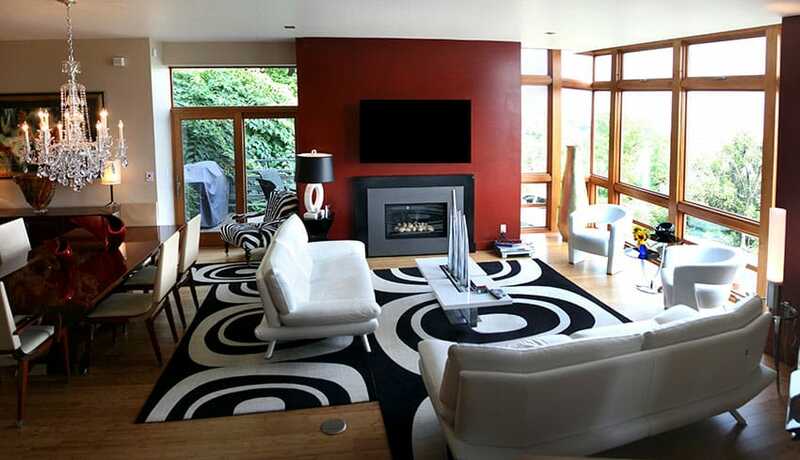 The casual contemporary living room space has artistic black and white décor, a unique patterned area rug, and an open floor plan that really take advantage of the room’s floor space. The red accent wall with an electric fireplace draws much of the attention of the room. The eclectic use of different design styles seen with the crystal chandelier, mid-century modern sofas and arm chairs, and retro modern feel of the other room decorations really make this room feel special. 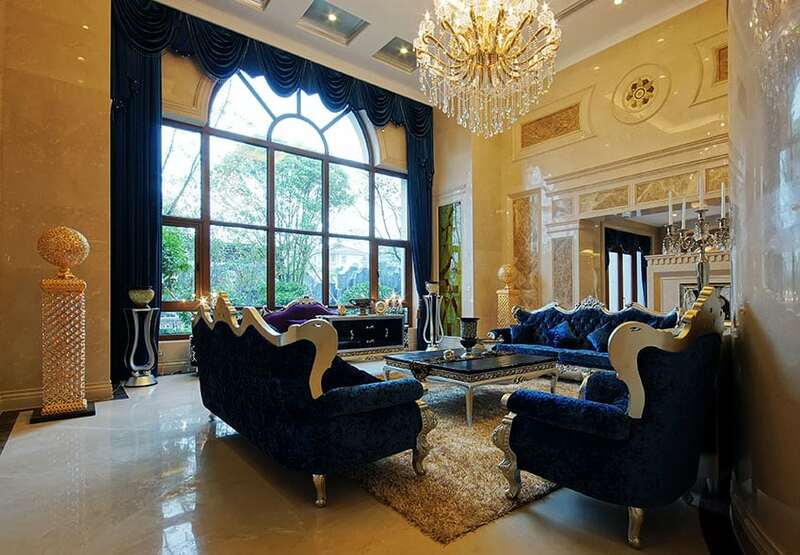 This luxury formal living room has dark blue fabric furniture, a high ceiling that is capped off with a beautiful crystal chandelier, and a large arching window that lets in light and openness into the room. The blue drapes also match the camel back sofas and arm chairs. The shag carpet nicely matches the tan polished marble of the floor. This marble treatment is also seen on the walls of the space. 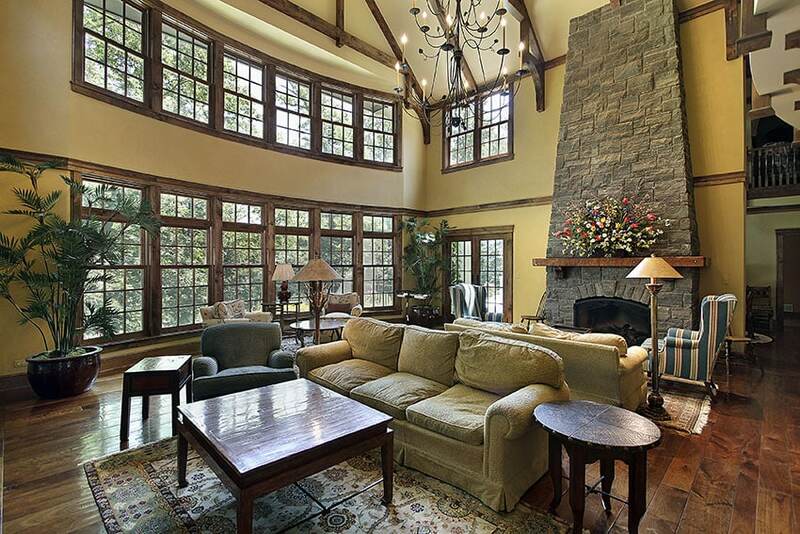 The high angled stone fireplace really enhances the beauty of this formal living room. With its stacked stone aesthetic and along with the wood floors, weathered wooden window frames, and the unique wrought iron chandelier, the rustic charm of this room really packs an aesthetic punch. The choice of having two sets of main seating areas – one facing away from the fireplace and one facing towards it – is also a smart design choice. Bright and spacious interiors such as this one commonly employ whites and tans for the color palettes and use several tall arching windows such as the ones found here. The central accent wall uses polished marble as a finish. The English loveseat sofas and the glass-top steel-framed tables are nice finishing touches to the design. Large living room ideas that use two tone walls that go all the way up can accentuate high ceilings and give the space a dramatic flair. The contemporary feel of this space is carried out by the modern light fixtures, squat square windows that let ample light in, and the choice of modern furniture and décor seen in the room. The central fireplace wall uses a contrasting dark black stone tile that offsets the lightness of the room.